Remote Management Manage content, playlist and screen settings remotely through www.doPublicity.com, using any device (PC, Tablet or Phone) with any system (Windows, Mac, Android). - Add / Edit / Delete content - Check screen update status - View content display proof of play 1,000+ Customizable Templates Create content from a selection of 1,000+ Customizable Templates, by personalizing with your pictures and text. Templates available for - Digital Menu Boards - Product Promotion - Events and Schedules - Slideshows LIVE Weather Use templates from a selection of colorful options. - Current Conditions - Short Term and Weekly Forecast Note: The weather updates every hour. Display Images, HD Video and Web Pages - Images (PNG, JPG and GIF) - HD video (MP4) - Documents (PDF, Word, Excel, PowerPoint) - Web pages - Scrolling Banner Media Player Model D424 - Processor (CPU): Up to 1.8 GHz - Quad Core - GPU (Video Card): 533 MHz - Quad Core - RAM: 2 GB - Storage: 8 GB - Wi-Fi: Built-in wireless 802.11 b/g/n Plug and Play The Media Player is quick and easy to setup: - Plug in the Media Player to the TVs HDMI port - Setup Internet access by connecting to a wireless or LAN network - Set the Media Player to run in FULL AUTO mode Estimated setup time: Under 3 minutes Phone, Email and Remote Support Note: If you plan on showing the same content on 2 (or more) TVs, you could use 1 Media Player + License with a Video Splitter.If you plan on showing unique content on each screen, you would need a separate Media Player and License for each TV. 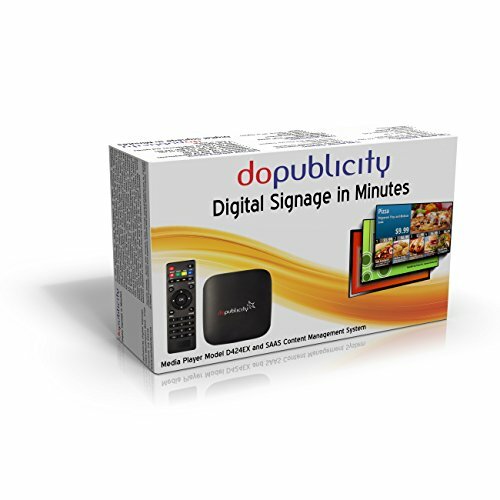 If you have any questions about this product by doPublicity, contact us by completing and submitting the form below. If you are looking for a specif part number, please include it with your message.